Thank you for joining us for our Stencil It Challenge and we hope you will join in with our new theme! We are showcasing Prima Flowers Products this week. You don’t have to use them to join in with the challenge, but if you have them we would love to see them used! 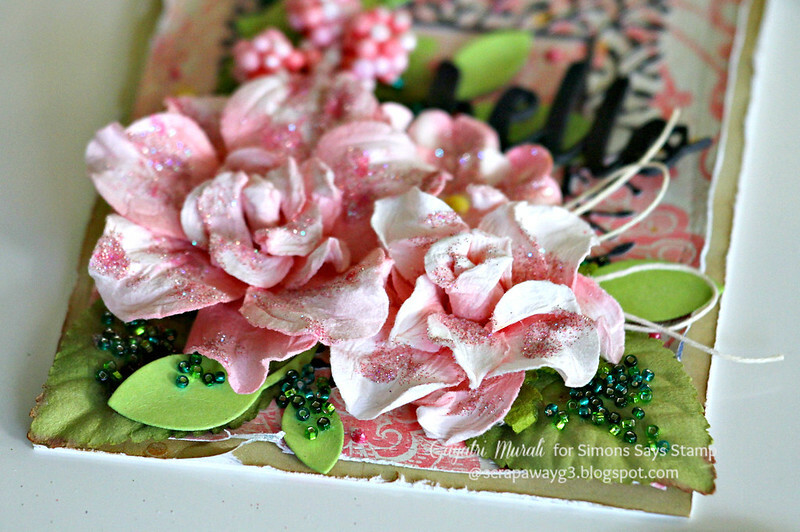 I have used Helena Royal Menagerie Prima Flowers. I love the different pink hues on the flowers and the complementary green coloured leaves. 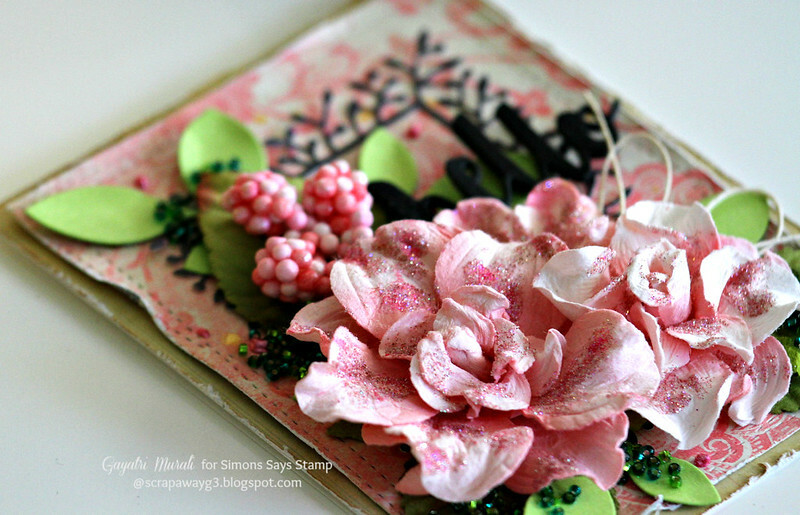 I totally wanted to make a shabby chic layered card. So I rummaged through my pattern paper stash and picked few pattern papers to go with the flowers. I honestly don’t know the brand of the pattern papers. I trimmed one pattern paper to the size of the card front, roughed the edges with the scissors, another pattern paper die cut using MFT’s Wonky Stitched rectangle die, again roughed the edges. I layered glued them. The frame is from Simon Says Stamp called Woodland Rectangular frame die cut using pattern paper. I then added leaves die cuts from green cardstock and Simon Says Stamp Clustered Leaves die. Then clustered and glued the Prima flowers and leaves. 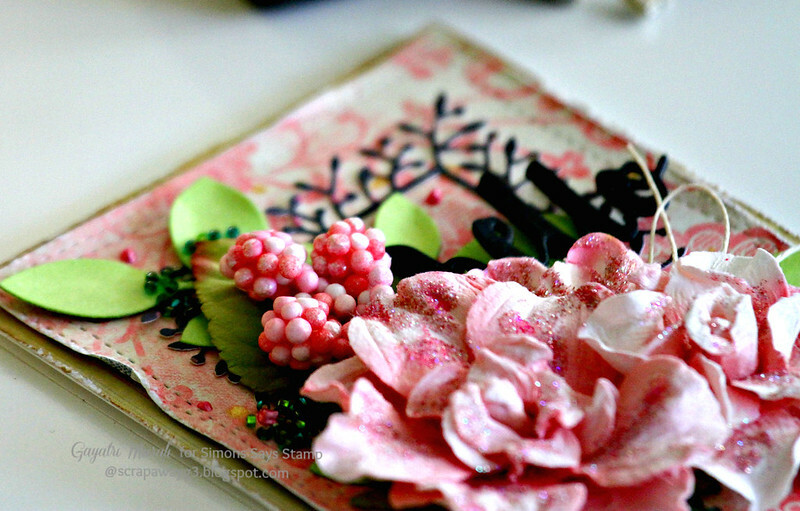 To add more texture and interest, I added pink glitter on the flowers and Woodland Seed Beed from Pretty Pink Posh. I also added liquid pearls and twine bow. The sentiment is Painted Hello from Simon Says Stamp die cut a few in black cardstock. They are stacked and glued before I adhered them on the card. I then glued the finished panel on Simon Says Stamp white card base. Here are some closeups of the card. This card should be displayed! Totally gorgeous! 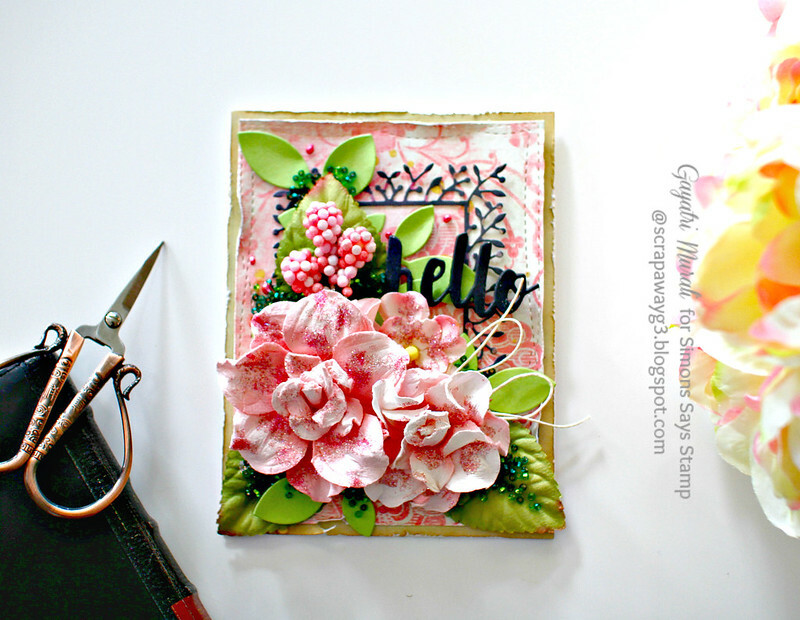 I love how you used the Prima Flowers, Gayatri! A beautiful card Gatatri, a gorgeous design with lovaly papers……..your flowers are beautiful with super sparkling and lovaly sentient!! What depth and detail – absolutely stunning. 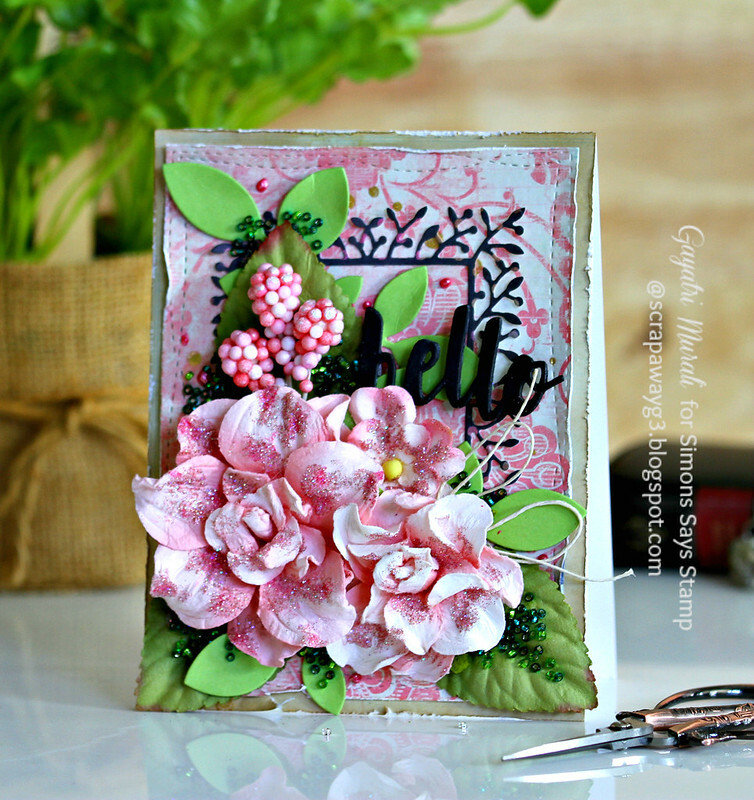 Stunning card, Gayatri! The dimension is over the top FAB!! Your flowers and berries look phenomenal!! It must have taken you hours to put this together and it's absolutely stunning! I'd frame and hang this one! !